We would love to see you and your family to join us in welcoming the Jewish New Year! 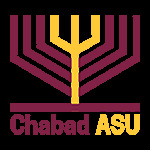 Celebrate our Annual Rosh Hashanah Dinner at Chabad at ASU together with Jewish students and friends. Please join us at out delicious Rosh Hashana meals. Entrees and special dishes include specialty entrees, exotic fruits, sweet foods and of course - Apple and Honey. Reservations can be made by clicking here.